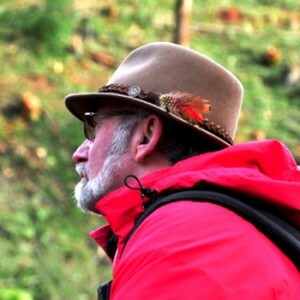 David Groeschl [rhymes with “special”] is Idaho State Forester and Deputy Director of the Idaho Department of Lands. One of seven children, he grew up near Fond du Lac, Wisconsin, where his father worked as a machinist for Giddings and Lewis, a storied manufacturer of industrial automation products that cut its teeth on saw-milling equipment and steam engines before the Civil War. Groeschl and his siblings grew up hunting and fishing “out our back door” near Lake Winnebago. “We caught, shot or grew just about everything we ate,” Groeschl recalls with fondness. The seven Groeschl kids – six boys and one girl – also learned how to garden and can, essential food gathering activities in a family of nine. “We all learned the growing and tending ethic from our father,” Groeschl said. Groeschl wanted to follow in his father’s footsteps after graduating from Fond du Lac High School, but his eight-hour-a-day apprenticeship at Giddings and Lewis machine shop soon convinced him he was not cut out to work inside. After Groeschl graduated from Stevens Point, he headed for Blacksburg, Virginia where he earned his master’s in forestry at Virginia Tech in 1991. He was soon hired by ITT Rayonier, a Jacksonville, Florida-based real estate investment trust [REIT] that owns timberland, commercial real estate and paper mills in the Southeast and Pacific Northwest. Groeschl worked for Rayonier in Florida and Georgia before accepting a position as Lakes States Regional Forester for the old American Pulpwood Association [now the Forest Resources Association]. Thereafter, he and one of his brothers formed a forestry consulting business. Nine years later, the Montana Department of Natural Resources hired Groeschl to be its Forest Management Bureau Chief. He held the post for four years, then became Division Administrator for Forestry and Fire and State Forester with the Idaho Department of Lands in Coeur d’Alene. 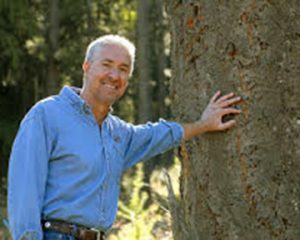 In this interview, Groeschl answers questions concerning Good Neighbor Authority [GNA], implementing legislation embedded in the 2014 Farm Bill that permits the Forest Service and the Idaho Department of Lands to partner with one another on high priority forest restoration projects on National Forests in Idaho. Groeschl is plainly excited about the innovative program, which he believes can do much to restore forest health and reduce the risk of wildfire in Idaho’s public forests. Evergreen: Mr. Groeschl, Good Neighbor Authority seems almost too good to be true. Will it really allow your forestry staff to help the U.S. Forest Service with its forest restoration work in Idaho National Forests? Groeschl: It will indeed, and the possibilities are very exciting. We have three designated projects and several more in the proposal stage. Evergreen: What makes Good Neighbor Authority more valuable than any of the other tools Congress has passed in recent years to help the Forest Service get more work done in diseased and dying National Forests? Groeschl: GNA allows the State and Forest Service to work together to do more restoration work on federal lands using State resources and contracting authorities. This provides more timely, flexible and cost-effective ways to get this work done. Evergreen: And helping the Forest Service with its forest restoration work fits within your Idaho Department of Lands mission? Groeschl: Yes. Seventy-five percent of all forestland in Idaho is owned by the federal government; seven National Forests, 20.4 million acres. The declining health of these National Forests poses serious resource, safety and economic risks to all Idahoans. Anything we can do to help our federal neighbors helps everyone. Evergreen: The elephant in the room that no one wants to talk about. Groeschl: Yes, in a manner of speaking, but GNA gives us a tool to talk candidly about it and act in the face of mounting threats posed by insects, diseases and wildfires. Evergreen: Let’s step back from GNA for a moment. You mentioned Idaho’s endowment lands. Tell us about these lands. Groeschl: When Idaho became a state in 1890, Congress granted the state 3.6 million acres of land to primarily support education. Idaho still owns 2.4 million of those acres, and we manage them in trust to maximize the long-term financial returns to the endowment beneficiaries. Evergreen: Are these primarily forestland? Groeschl: Endowment lands are a mix of forest, range, agricultural, commercial and residential real estate assets. Forest lands make up a little less than one million acres. Evergreen: How are endowment forestlands managed? Groeschl: Endowment forestlands are sustainably managed and open to recreational use. Last year, we sold 260 million board feet of timber valued at $61.6 million. Land management expenses, such as salaries and operating expenses, are deducted with the remaining revenue going to the endowment beneficiaries, mainly education. All management activities comply with state and federal environmental laws. Most of us have kids in public schools, so we share a great sense of accomplishment. Evergreen: You harvested about the same amount of timber from endowment lands as the Forest Service harvested from about 20 times as much land. Groeschl: It comes down to clarity of mission and laws. 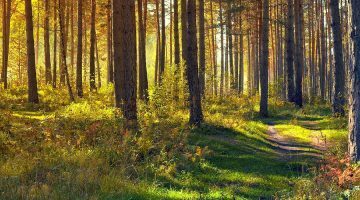 We have a clear fiduciary responsibility to manage endowment timberlands for long-term income to the beneficiaries. 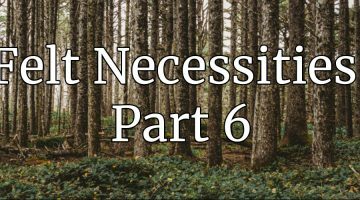 The Forest Service has a multiple-use mission and a complicated patchwork of laws that make it difficult to get work done. Evergreen: What does Good Neighbor Authority provide that allows two public agencies with such different missions to help one another? Groeschl: The 2014 Farm Bill set the stage. It included an amendment to the 2003 Healthy Forests Restoration Act (HFRA). The amendment authorized state governors to identify areas at high risk of insect and disease mortality on National Forests within state borders. Governor Otter asked the lands department staff to work with our state’s nine volunteer collaboratives and the Forest Supervisors to identify these high-risk areas. The Farm Bill gave us 60 days to get it done. Evergreen: Wow! How’d that go? Groeschl: Very well. Our staff worked closely with the collaboratives and Forest Service staff. Using maps and data provided by the Forest Service we identified 12.6 million acres of National Forest land that were suitable for some form of management. Overlaying national insect and disease and fuel condition class risk maps got us down to 8.8 million acres that were at high risk to mortality. Evergreen: Class 3 lands being ready to burn and Class 2 lands not far behind. Groeschl: That’s correct. On those 8.8 million acres at high risk, we identified 1.8 million acres and 50 possible project areas that had local Forest Service and collaborative group support. These project areas became the list that Governor Otter submitted to Agriculture Secretary, Tom Vilsack. All 50 were approved. Evergreen: And all 1.8 million acres you identified are roaded and classified as being suitable for management, and no politically contentious roadless areas in the mix? Groeschl: That’s correct; and I should add that the Nez Perce-Clearwater National Forest recently identified another 1.8 million acres on just that forest. The Idaho Panhandle National Forest is also considering additional HFRA designations. Evergreen: So how do we get from identifying high priority restoration projects to Good Neighbor Authority and all its possibilities? Evergreen: A very good question given the difficulties associated with getting anything done on National Forests. Groeschl: It was one of those serendipity moments when you knew that the potential was huge, but the challenges equally daunting…kind of like entering the Fire Swamp on the movie Princess Bride. We walked away from that meeting asking ourselves, what could the Idaho Department of Lands do to help but not get lost in the “fire swamp”? Groeschl: The 2014 Farm Bill permanently authorized stewardship contracting and Good Neighbor Authority. Stewardship contracting lets the Forest Service trade goods for services. 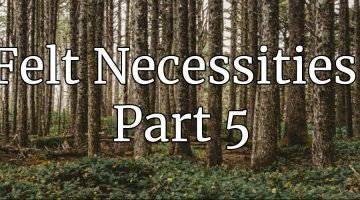 One example is to use the value of the trees harvested in a thinning project to offset the purchaser’s cost for doing work in campgrounds or along streams. The agency does a lot of this kind of work. Evergreen: But you chose to head down the Good Neighbor trail. Why? Groeschl: Stewardship contracting doesn’t offer the efficiencies we see in GNA, which lets us use our own contracting tools and authorities. Our contracting mechanisms provide more flexibility and efficiencies than the more cumbersome federal processes. Evergreen: Do GNA projects run through your contracting process meet NEPA and NFMA requirements? Groeschl: Yes, we are still required to dot all the I’s” and cross all the “T’s” that the National Environmental Protection Act and the National Forest Management Act mandate, but we do it through our more efficient contracting system. At times, the State assists the Forest Service in the NEPA process by contracting for NEPA specialists or data collection. While the silvicultural treatments on Forest Service differ from endowment lands, our foresters recognize that they have a different mission. Groeschl: Our goal is to help restore the health of our National Forests and reduce insect, disease and wildfire threats to our communities and adjacent forest landowners. Evergreen: We suppose a certain amount of diplomacy is necessary given the Forest Service’s long history of doing things its own way in its own time. Groeschl: Our cultures and mandates are different, but we are all professionals, and we all share a love of forests. Many in the Forest Service would like to get more done, but the Gordian knot of conflicting missions and regulations imposed by judicial rulings and Congress leave federal land management agencies in an intractable position. Evergreen: We know all about the crippling impacts of the Gordian knot, so to purposefully change the subject, reassure us that GNA is not the beginning of some clandestine effort on the part of the State of Idaho to take over National Forests in Idaho. Groeschl: The Department of Lands has not advocated for the transfer of federal lands but has followed the Governor’s lead in working cooperatively with the federal agencies to explore ways to increase the pace and scale of forest restoration in Idaho. GNA’s success is the best defense against going down the land transfer road. Some environmental groups recognize the value of GNA’s success while others are stuck in the past. They may say that they support forest restoration, but their actions tell another story – likely keeping the land transfer debate alive. Groeschl: Because the land transfer argument is rooted in the growing public concern that the Forest Service isn’t attacking its forest health crisis on a meaningful scale. GNA allows us to help the Forest Service treat more at-risk acres every year than the agency otherwise could, given its current funding and staffing levels. Evergreen: Let’s go back to what you discussed in your meeting with Tom Schultz and Governor Otter. There had to be more to your chat than a mutual realization that you were about to enter the Fire Swamp. Groeschl: [Laughs] Well, there was. We saw the opportunity to grow GNA into a program that is additive and self-sustaining. By additive, I mean that the acres treated by GNA would be in addition to what the Forest Service was currently doing. We also want to use the power of Idaho’s markets to generate enough program income from GNA projects over the next five years so the program is financially self-sustaining – meaning we don’t want to have to ask for ongoing taxpayer or private funding to keep the program going. Evergreen: Your Lands Department information sheet indicates that you have start-up funding from the Forest Service, the Idaho Legislature and three Idaho forest products manufacturers. Groeschl: That’s correct. The Forest Service and three Idaho forest product companies have agreed to provide start-up funds for up to five years. Each year, the Forest Service contributes $300,000, industry contributes $200,000 and the State contributes $250,000. These start-up funds are used to pay for contracted services and IDL staff time to prepare and administer GNA projects. Groeschl: For now, yes. The goal is for GNA projects to generate enough income so that the GNA program becomes financially self-sustaining within five years when the start-up funds go away. An example is the Wapati thinning project on the Nez Perce-Clearwater National Forest, the first GNA project sold by IDL. McFarland Cascade, a cedar pole company, purchased this timber sale which is expected to net about $1.2 million after deducting Forest Service and IDL expenses. Evergreen: Where does the $1.2 million go? Groeschl: It will be held in trust by the State and used to fund restoration work on the Wapiti project area and prep work on future GNA projects on the Nez Perce-Clearwater National Forest. Some projects will generate revenue and others won’t. Evergreen: Give us an example of a non-revenue generating project. Groeschl: Upgrading facilities in a campground. Placing large woody material in streams to improve fish habitat. Thinning young, overstocked stands to improve growth and resiliency. These projects cost money but don’t typically have the revenue-generating component that includes harvesting commercially valuable timber. Evergreen: Doesn’t some of the GNA profit go to counties in which the work is done, much like harvest receipts did for decades? Groeschl: Yes, 25 percent of the stumpage fee paid to the Forest Service on each GNA revenue-generating timber sale goes to the counties. GNA allows for payments to counties and stewardship contracting does not; another reason why we chose to go down the GNA road. Evergreen: What was the state’s role in the Wapati project? Groeschl: The Forest Service had already done most of the field work, but the 2014 and 2015 wildfire seasons left the agency with no time to complete their work. We put the timber sale package together and got it sold within six weeks. It’s a 204-acre thinning project with an estimated harvest volume of 4.4 million board feet. We expect McFarland-Cascade’s logger to start work after spring break-up, when Forest Service roads can again support the weight of heavy equipment. Evergreen: Your GNA information sheet suggests to us that no two of these projects are the same. Groeschl: That’s certainly the case with our first three projects. At Brundage, on the Payette National Forest, we will be laying out several treatment areas totaling about 180 acres, marking cut and no-cut trees and estimating harvest volumes – I’d guess around 800,000 board feet. Hanna Flats, a thinning project near Priest Lake, covers about 2,000 to 3,000 acres and may yield about 8.5 million board feet. This project has been on the Idaho Panhandle National Forest drawing board for some time. The Forest Service will oversee the public involvement process and IDL will hire contractors to collect data and provide NEPA support. Once NEPA is done, IDL will prepare and administer this thinning project. Evergreen: What challenges do you see with GNA that need to be overcome? Groeschl: Good Neighbor Authority doesn’t allow for road reconstruction on existing haul roads out of the forest, yet most projects will require it. We can’t replace a culvert that is impeding fish passage, replace a failing bridge, or stabilize drainage structures to protect water quality. Evergreen: How on earth did this silliness happen? Groeschl: Draft language authorizing GNA in the 2014 Farm bill originally included language allowing road reconstruction. This triggered the ire of unions who expressed concerns about the potential loss of Davis-Bacon wage requirements on federal highway projects. To gain support for GNA and passage of the 2014 Farm Bill, the road reconstruction language was removed. Evergreen: One hopes someone will help them understand the difference between gravel roads in the woods and our interstate highway system. Groeschl: I believe progress has been made and hopefully, a fix will be coming soon. Evergreen: Earlier, you referenced the fact that completed GNA projects won’t look much like what you are doing on state endowment lands. Can you describe the difference between what you would do on endowment lands and what you will be doing in National Forests in partnership with the Forest Service? Groeschl: Sure. We manage for desired future conditions on endowment lands. We account for tree species and age-class diversity, habitat needs, tree-stand density, market conditions, and forest resiliency – all with the goal of minimizing environmental risks and maximizing revenue over the long term. By contrast, the Forest Service has restoration goals tied more to historic conditions and multiple-use goals. Evergreen: The term restoration, which we like in some ways, seems a little goosey in other ways. What’s your take on forest restoration? Groeschl: What we are restoring is resiliency, the ability of a forest to be sustained over time in the face of natural disturbances such as insects, disease and wildfire. In Idaho’s National Forests, annual mortality now exceeds net growth. Doing the necessary thinning and stand-tending work slows mortality, reduces fuel loads, and allows the forest to stabilize itself and be more resilient to pathogens and fire. Evergreen: We have some amazing before and after pictures of thinning work done in forests that had grown too dense to sustain themselves, but what you’re talking about here includes restarting natural processes that can’t be seen unless your eye is trained to look for them. Groeschl: That’s true. It’s vital that we keep our many publics well informed as we grow the GNA potential in Idaho’s National Forests. Evergreen: Can you give us some sense for the potential? Groeschl: Our Director, Tom Schultz, set a “moon shot” goal for the Department. Ten years out, he expects us to add 100 million board feet annually to the log market. Evergreen: That would certainly put all the under-utilized wood processing capacity in Idaho to work, but don’t you think such a harvest increase in National Forests will make conservation groups very nervous? Groeschl: It will if we don’t communicate with them regularly. The 100 million board foot number that Tom threw out is much more than just about harvesting trees. It’s simply one metric to represent all the other restoration work accomplished such as fuels reduced, roads repaired, stream miles improved and the list goes on. Evergreen: The presence of sustainable and unsubsidized markets for wood and paper products made from logs makes all the difference, doesn’t it? Groeschl: If we did not have access to these markets, there is no way this work could be done because the government doesn’t have the money to pay for it. The key is using revenue-generating GNA projects to pay for non-revenue generating restoration work. Evergreen: Is it possible to express your GNA goal 10 years hence in terms of forested acres treated? Groeschl: To achieve Tom’s “moon shot” goal, we would have to treat about 10,000 to 12,000 acres annually. At that rate, it would take over 700 years to treat the entire 8.8 million acres at high risk on the National Forests in Idaho. As you can see, we’re taking a small bite out of the elephant. Evergreen: Knowing what we know about mixed conifer, dry site forests in the Intermountain West, will you have to go back and treat those areas again in the future? Groeschl: Yes, you are correct. That’s the beauty of forests, they keep growing! Assuming GNA is still in our forest restoration tool kit, we would return to our earlier projects at 15 to 30 year intervals to remove less desirable trees and create more growing space for the remaining trees. Evergreen: You talk like a guy who is in this for the long pull. Groeschl: The Idaho Department of Lands is committed for the long pull. It’s not “one and done” when it comes to managing forests.